DeGRAFF — Shady Bowl Speedway opened it gates Saturday to a full pit area as four divisions of stock cars tackled the rural oval. 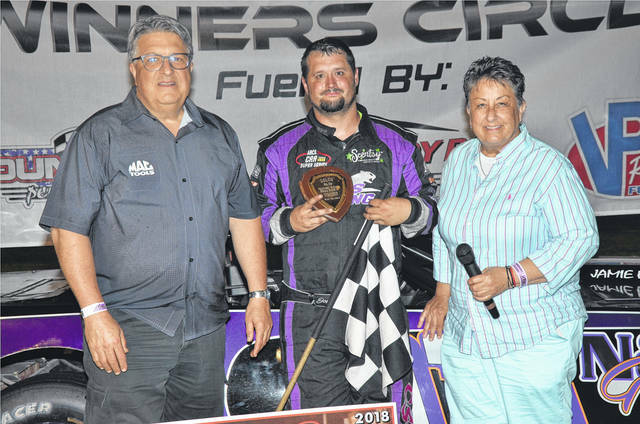 Shady Bowl honored the memory of Sidney car builder Denny Shatto and local driver Neal Sceva. Sceva, from Urbana, posted over 600 feature wins during a star-studded career. Some of the area’s top drivers drove cars built by Shatto to victory lane. The Dave Nagel Excavating Shatto Memorial saw the top four qualifiers locked into the 20-lap race. The top three finishers in the two heat races also were locked in to the 10-car feature. Columbus driver Jacob Muncy led the entire way to the notch the win and take home $1,110. The win was far from easy as Muncy, who also won a heat race, was pressured by Quincy resident Josh Smith. Smith had gotten around Muncy once, only to have a yellow come out. The field fell back to the last completed lap, which gave the lead back to Muncy. Muncy was behind the wheel of Curt Frazier’s outlaw-bodied stocker. Rookie Nic Burnside turned in a top notch job of driving as he won the dash and was third in the feature. Fast qualifier Mike Ward was fourth with Jim Lewis Jr. fifth. The 51-lap Neal Sceva Memorial saw 23 cars take the green flag. Jason Mahaffey led the first lap before giving way to Rodney Roush. Roush held the lead until Quincy’s Josh Smith sped by on lap 28. Smith was behind the wheel of the N&W garage Camaro owned by Darrell Dexter. Smith, who also won the dash, held off Chad Small II, Rob Schaeff, Phil Gussler Jr and Josh Longstreth to post his first street stock feature win of the season. Corey Plunkett, Longstreth and Jim Lewis Jr posted heat wins. Joshua Poore was fast qualifier. Smith picked up $1,051 for his efforts. Gussler won the DeGraff Service Center Hard Charger Award. The Biggins Small Engine Repair modified feature saw Cedarville driver Mike Carroll lead all the way to win the event. The win was the first of 2018 for Carroll in his Miamisburg Auto Service sponsored car. Carroll also was a heat winner. Ross Klingelhofer was second , with Daniel McPherson third. Sean McNeeley fourth and Brad Yelton fifth. McNeeley was the dash winner with Doug Hewitt Jr. also winning a heat. Greg Stapleton set quick time. The 100-lap Summertime Shootout for the Buckeye FWD Mini Stocks was an exciting race, with 19 cars taking the green. Curtis Noble led the first early laps before giving way to Aaron Chatfield. Noble came back to retake the lead on lap 12. Ryan Tamburro took the lead next, but was passed by Justin Pope. Jimmy McElfresh came to the front to lead lap 69. Pope soon retained his lead and went on to notch the win. Tamburro was second, with McElfresh third, Eddie Kemp fourth and Jimmy Huffman fifth. Pope also was fast qualifier. This Saturday, Shady Bowl will hold the makeup 62-lap Ken Stookey Classic for the street stocks as well as the Bill Lewis Memorial for modifieds. The second leg of the Van Hoy Oil Shoot-Out Series will run a 50-lap feature. There will also be a 100-lap enduro. The spectator drags will round out the action. Racing will start at 7 p.m.